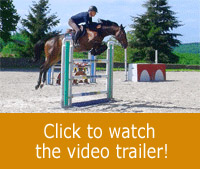 This gymnastic is excellent for horses who have a tendency to jump with a hollow back. The jumps’ setup will encourage them to stretch their top line and jump in the middle of fences in combinations. For this exercise, Michel rides Tosca, a young 7 year old Selle Francais mare. Previous to the exercise, Michel warmed-up Tosca over some small fences. The warm-up phase is important to get the tendons and joints ready. Start by jumping the grid with low fences. The horse needs to get accustomed to the fences set-up as to not be confused since it would lead to the opposite of the desired goal. The goal is to encourage the horse to stretch as much as possible over fences. Therefore, it’s important to build confidence and favour relaxation. 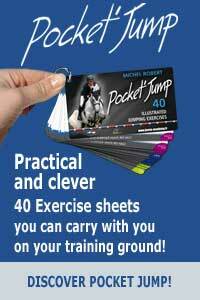 Michel explains also the benefits of this exercise to gain in style as it encourages the horse to tuck his knees up over fences. Indeed, the horse is channelled by the set-up, and therefore needs to push symmetrically with his four feet which leads to a better use of his pushing power. The fences at the beginning of the grid for some horses, the ones at the end of the grid for others. Michel insists on how important it is for the rider to stay really straight and aligned with his horse. One more time, your eyes are an important and effective aid to line-up your body with the median axis of your horse. Indeed, it will be difficult to keep the horse straight in the combination if the rider’s position isn’t symmetrical. If the rider succeeds in keeping his eyes up and looking further away than the grid, the imperfections will be solved. After you went a couple of times over the grid, you can add a Liverpool to increase the stretching movement over the fence.